On Monday, July 10, Saint Felicity’s Day, a baby boy was born at eleven in the evening. Little is known about the circumstances of the birth itself except that Jeanne’s labor was difficult and the baby appeared so weak that the family feared it would die. On July 13, at two in the afternoon, Adrien, the baby’s grandfather Nathé Weil, and great-uncle Louis Weil, went to the town hall in the sixteenth arrondissement where they signed a birth certificate bearing the child’s given names: Marcel Valentin Louis Eugène Georges Proust. During the next two weeks, Jeanne and Adrien slept little as they constantly took care of their baby who remained in poor condition. Then, to their great relief, they realized that the little boy’s life was no longer in danger, although he remained frail. When school ended at three o’clock, Marcel and his friends often headed for the gardens along the Champs-Élysées or the nearby Parc Monceau where they would play. Among his playmates were Lucie and Antoinette Faure, daughters of Francois-Félix Faure, a family friend and future president of France. It was Antoinette Faure who asked Proust to fill out the first questionnaire. This facility is the site of two important scenes in the novel. "No doubt the keeper, before entering upon her tenancy, had suffered setbacks. But Francoise was positive that she was a marquise and belonged to the Saint-Ferréol family. This Marquise warned me not to stand outside in the cold and even opened one of her doors for me, saying: “Won’t you go inside for a minute? Look, here’s a nice, clean one, and I won’t charge you anything.” Perhaps she made this offer simply in the same spirit in which the young ladies at Gouache’s, when we went in there to order something, used to offer me one of the bonbons that they kept on the counter under glass bells, and which, alas, Mamma would never allow me to accept; perhaps, too, less innocently, like an old florist whom Mamma used to have in to replenish her jardinières, who rolled languishing eyes at me as she handed me a rose. In any event, if the “marquise” had a weakness for little boys, when she threw open to them the hypogeal doors of those cubicles of stone in which men crouch like sphinxes, she must have been moved to that generosity less by the hope of corrupting them than by the pleasure that all of us feel in displaying a needless prodigality to those whom we love, for I never saw her with any other visitors except an old park keeper." In The Guermantes Way, the toilettes are where the narrator's grandmother suffers a stroke. In the early summer months before graduation there was great excitement in Proust’s neighborhood where the Statue of Liberty was being assembled in time to make a birthday gift to France’s oldest ally. The occasion for this magnificent gift to the United States was the centennial of the French Revolution, for the celebration of which Paris had planned a world’s fair. On April 1, 1889, the City of Light inaugurated the fair’s and the world’s tallest structure that soared 984 feet (300 meters) into space. This controversial tower of indefinable symbolic value was something the likes of which no Frenchman had ever seen and for which most Parisians already felt prodigious Gallic contempt. This incredibly expensive curiosity had been erected on the Left Bank of the Seine by a friend of the Prousts, an engineer named Gustave Eiffel. Madeleine Lemaire, the artist and society hostess who illustrated Proust’s first book, Les Plaisirs et les jours (Pleasures and Days) adored her pet dog Loute. She talked to her canine companion constantly, seeming to believe that the dog had acquired from her an appreciation of art and architecture. So certain was Madeleine of the canine’s interest in architecture that she had visited the 1889 World’s Fair once briefly so that Loute could admire the Eiffel Tower. In this Paris, whose beauty in 1914 I had seen awaiting almost defenseless the threat of the approaching enemy, there was certainly, as there had been then, the ancient unalterable splendor of a moon cruelly and mysteriously serene, which poured down its useless beauty upon the still untouched buildings of the capital; but as in 1914, and more now than in 1914, there was also something else, there were lights from a different source, intermittent beams which, whether they came from the aeroplanes or from the searchlights of the Eiffel Tower, one knew to be directed by an intelligent will, by a friendly vigilance which gave one the same kind of emotion, inspired the same sort of gratitude and calm that I had felt in Saint-Loup's room at Doncières, in the cell of that military cloister where so many fervent and disciplined hearts were exercising themselves in readiness for the day when, without hesitation, in the midst of their youth, they would consummate their sacrifice. ...two or three days before the victory of the Marne, when the siege of Paris seemed imminent, I got up one evening and went out into a clear, resplendent, reproving, serene, ironic and maternal moonlight, and seeing the immense city which I never knew I loved so much waiting in its futile beauty for the onslaught that nothing seemed capable of preventing, I couldn't refrain from sobbing. This restaurant, at 51 quai des Grands Augustin, dates from the late 18th century (1766). Its private dining rooms were frequented by some of France’s most distinguished writers including Charles Baudelaire, George Sand, and Victor Hugo. This restaurant and the Paris street bearing the same name feature in Proust’s novel. Proust moved here with his mother and father in 1900. This residence was near the Parc Monceau where Proust and his brother Robert had played when they were chidren. 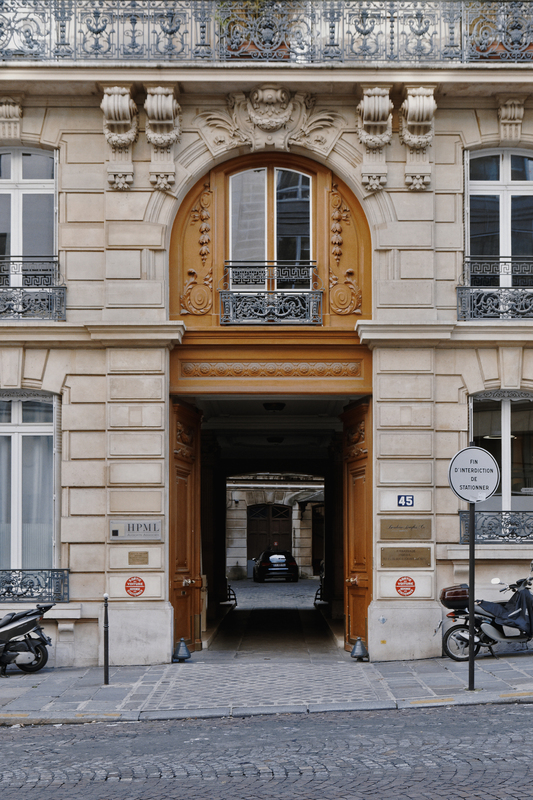 Proust lived with his family at this address until 1900. This church built in the neo-classical style was completed in 1842. It is dedicated to Mary Magdalene. Madeleine is, of course, a name with many Proustian resonances. The church is located in the eighth arrondissement, not far from nearly all the places where Proust resided. Even in Paris, in one of the ugliest parts of town, I know a window from which one can see across a first, a second, and even a third layer of the jumbled roofs of several streets, a violet bell, sometimes ruddy, sometimes too, in the finest "prints" which the atmosphere makes of it, of an ashy solution of black, which is, in fact, nothing else than the dome of Saint-Augustin, and which imparts this view of Paris the character of some of Piranesi's views of Rome.